Capes will definitely be added to Minecraft after a while, but until this point we could not so easily install them. With this skin pack you have the opportunity to try on a cape, but there is a drawback. Capes are attached to skins, that is, you can choose a skin only with a cape. 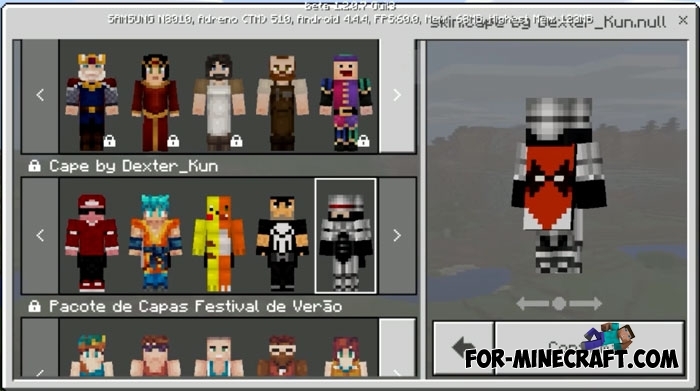 Thanks to sites like minecraft.novaskin.me, you can easily create your own unique skin with the cape and then add it to Minecraft PE 1.2. Also the skin pack contains the main file (skin.png), edit it using any photo editor as you want or download the ready skin. The custom skin is visible in multiplayer but without a cape, a single game perfectly displays any changes visible only to the player. It's unlikely that developers will support third-party skin packs in the next game updates due to paid content, so use this as long as possible. Below is a video showing a small manual how to properly create and install a skin pack, and also add your own skins to it.